Hi everyone! 😀 This is the fourth – and final – blog post from my trip to Sims Camp in Germany. 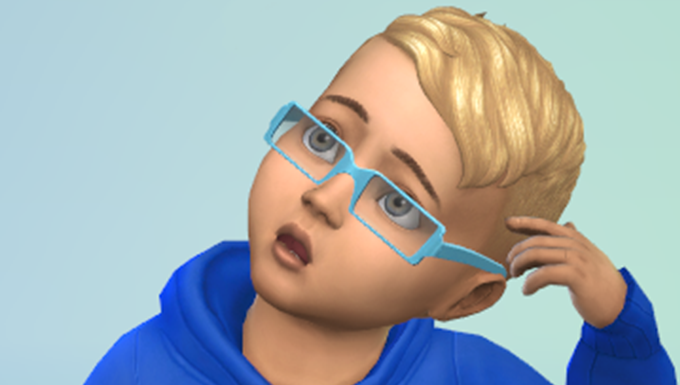 I even made a special Category Tag: Sims Camp, so you can read all these blogs in one place. Final Day at Sims Camp! 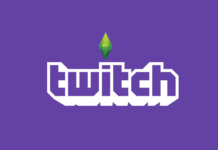 Today’s schedule included a live demo of The Sims 4 Buy/Build Mode by lead designer Aaron Houts, The Sims 4 Animations Class presented by Marion Gothier, and The Sims Live Broadcast presented by King and SimGuruRyan. 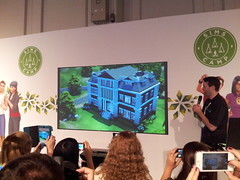 ❗ Please be aware that The Sims 4 build shown at Gamescom was in a Pre-Alpha stage. This means that everything from graphics to tools is a work in progress. Everything I am going to share with you below, is indeed factual as of Gamescom, but there will/may be plenty of changes come release time. 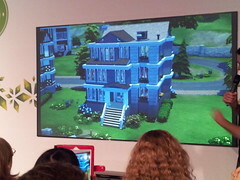 Build mode is one of the features of the game the developers wanted to make less intimidating for the average user. Most players (myself included) cannot build if their lives depended on it, and probably finds build mode scary and frustrating. I know I do! 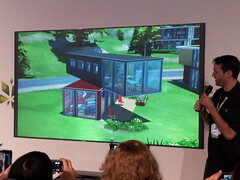 To ease the pain of build mode – for both the advanced and noobie user – developers have created a system of modular rooms for players to work with. Pull, Push, Tug, and Move! 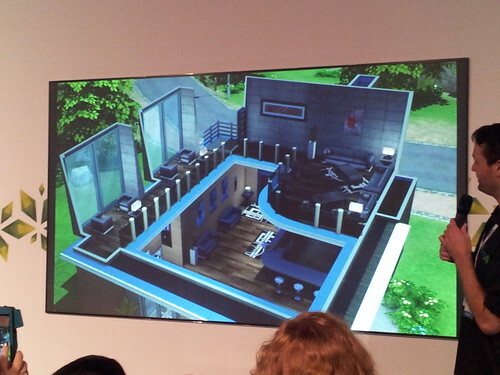 The new build system that has been implemented to the game, recognizes “closed walls” as one “room” in the home. Once you have closed off all the walls, the game allows you to lift and drag that room anywhere on the lot. This also includes moving a single room to another level of your home. In the photo below, you will notice a white border around one single room in the center of the home. This room can then be moved anywhere else on the lot, even if it is not attached to the home. There’s even a rotation tool that will auto rotate the room for you. Even after you have created a room and moved it to the second story of your home, you can still re-size the room to your liking. If you only need to move a room over a few tiles, that’s also possible. The burden of creating a room one tile too far to the left is no more with The Sims 4. Builders rejoice! Another great feature is the ability to split a single room into two or more rooms. If you take a single wall and run it through the center of a room, it will then turn into two separate rooms that you can move and re-size accordingly. Worried about what happens to the objects inside the rooms you are moving? Guess what? They move right along with your room. 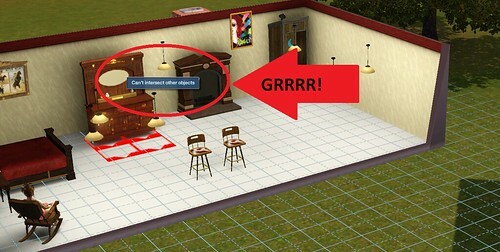 You will not have to spend additional time moving your objects to recreate the room you originally had. 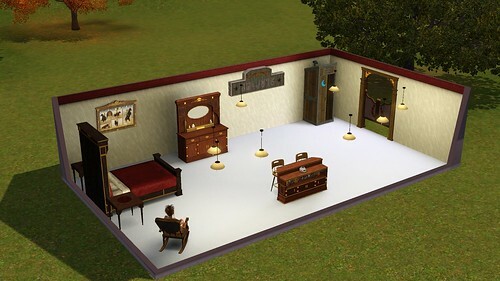 If you extend the wall to increase the room size, the objects on the wall will remain in tact, while the game organizes the rest of the objects and furniture to make it look as organized as possible. Of course, you can always move and tweak the objects to your liking. Are you also worried about objects that are in the way of splitting a room with a single wall? Worry no more! 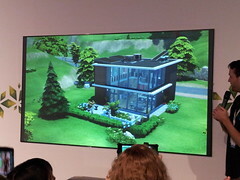 The Sims 4’s build mode will automatically adapt and move any objects that are in the way to either of the two new rooms. Not in The Sims 4! Another great feature with the new build mode, is the ability for the room to automatically adapt to what you are trying to create. Here is an example of how a second story room is adapting to the size and layout of the first story. 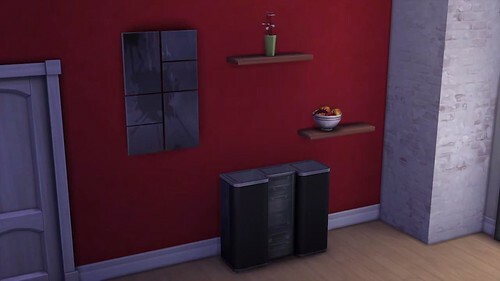 With all this talk about walls, it is best inform you now that Curved Walls are not coming to The Sims 4. There are technical reasons (related to objects) behind the lack of curved walls, but there are definitely curved fences. Still better than nothing! Curved fences are a separate build object that comes in various sizes, and can be used indoors and out! Using them outdoors would allow players to create balconies, gazebos, and other “curvy” designs. One example of using these curved walls indoors is shown off in the photo below. Haven’t had enough will walls yet? Good. There is another amazing feature coming in build mode: Different wall heights! We were told that there can only be a total of 3-stories and a roof to a home (as of Gamescom), but you can alter the heights of walls on each level as you please. Another bonus? Windows will adjust accordingly! Now that the walls have been placed and your home is in the shape you want….DOH! Foundations! Well not worry folks. You can place foundations even after you have built your home. You will have 3 different foundation heights, and 8 foundation types, to play with. Stairs that you place onto the foundation will also adjust to the height changes. Moving on up to the roof. 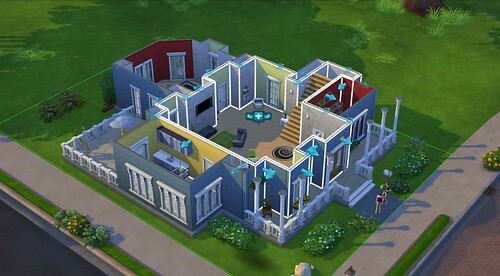 Similar to the push and pull when creating a room for your homes, The Sims 4 introduces the ability to mold and shape the roof as you please. You can also curl in the edges (including the eaves!) or mold them out to create an awesome pagoda roof. What allows this type of movement on the roof, is that they are no longer drawn onto the home, but instead individual shapes you can place to fit. You can use multiple textures, create different roof shapes, and tug and pull the roof to any length you desire….all on the same home. Additionally, you can also create a flat-roof, which will allow you to create Roof-Tops. If you’re a player who loves to create multi-level homes with columns and fences, you would typically need to use a cheat that allowed for a column to be placed in the fence. Not anymore! Columns can now be placed anywhere in fences, and there’s no tedious cheating required. If you’re not the “column” type, you don’t have to use them either! Why?…. …Introducing Cantilevered Rooms! That’s right, you can create any crazy designs you want, and there is no need for a column to support the extended room of a house. The Cantilevered rooms allow for any room to “hang” off the edge, or “protrude” from the home, without the need of visible support. 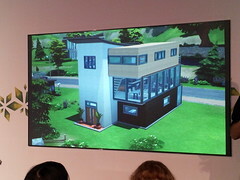 Automatic window placement is yet another feature introduced in The Sims 4. 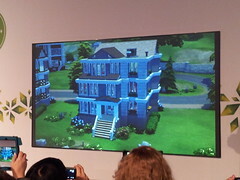 When building your home, the game will automatically place windows around your home. (On a side note, if you have any paintings hanging on the wall, a window will not be placed there) With the “smart” technology fueling this type of feature, windows will be spaced out properly and look “right”. You can always go in and move or delete individual windows as you please. You can filter magazine mode by color and style. As examples, we were shown Victorian and Modern styles, all available in different color schemes. If after you place a preset room you want to change it, feel free to move, delete, and add any individual items you please. And yes, you can mix and match objects from different styles and color schemes. 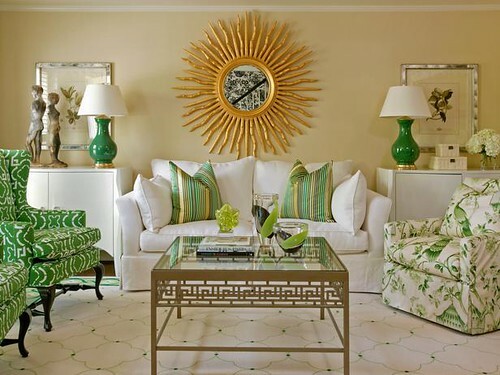 ♦ No comment on using the an “eyedropper” type tool to duplicate a room. ♦ Vertical placement of paintings and mirrors is included in base game. Overall, I am loving everything we’ve seen thus far. The objects in game look very crisp & detailed, and the building tools are beyond accommodating. Coming from someone who has spent less than 20 minutes at a time in build mode, I am 100% certain that amateur/inexperienced builders will spend hours building their first home. 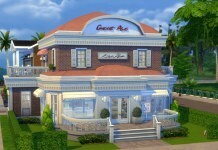 If you are an experienced builder, I can guarantee that you will love the flexibility of the new tools, as well as continue to enjoy the difficulty of what makes you the greatest. Animations are a major part of any game. From walking, to talking, animations sculpt the game into the final product it will become. In my opinion, animations in The Sims 4 have become the biggest improvement in the entire series. ❗ Please note that we were not given any media assets for The Sims 4 Animations, and we were not allowed to take any photographs during the demo. Marion started off by showing us a demo of how they actually make animations (the process), and then gave us a little background on the work she has done for The Sims series. 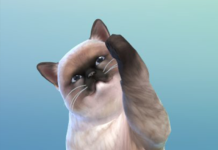 One of the major accomplishments by Marion, was her dedication to write tools for the animators to create puppies and kitten for The Sims 2 Pets. Without her dedication, we would not have had baby pets! What they want to accomplish as far as animations, they intend to deliver. 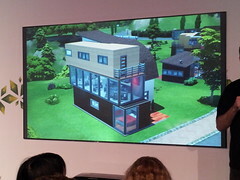 The demo started off showing us how realistic the movement of Sims in The Sims 4 is. One of the most irritating things about the Sims in The Sims 3, is that they are completely robotic. When you tell your Sim to “move there” the end result is robotic movement and backsteps. :! :Aside from being able to turn 360 degree on a dime, Sims can also walk far lengths, and then turn a smooth 180 to head back to where they came from. ❗ The ability to turn 360 degrees in any direction, also eliminates the struggle of small spaces and group conversations. No more foot tapping! ❗ In addition to walking naturally, Sims will also take a seat naturally. No Robotic spins to sit! There are a total of 60 animations put together to create these smooth 360 degree motions, and this is just for “movement”. At this point in the demo, Marion stopped to explain to us the mechanics behind animation and height. 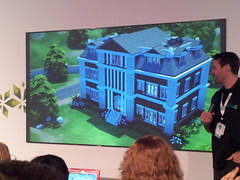 One thing that bothered Marion the most, was that Sims were not consistent when it came to performing certain actions. They could perform certain actions standing up, and then others only when they were sitting down. In The Sims 4, this has all changed. Anything that can be done standing, can also be done while sitting. 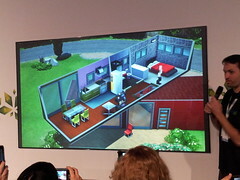 This includes talking at opposite ends of the bed while actually sitting on the bed, as well as being able to engage in conversation with standing and sitting Sims. They have also developed some amazing tech that allows for Sims to perform the same animation in any chair. Anything that can be done on a love seat, can also be done on a bar stool. What they did was add the equivalent of little “magnets” from the butts to the ankles of the Sims, and those magnets attach themselves to points on the chair. This ultimately allows any animations to be performed anywhere. With all this talk about movement, you must be asking yourselves about routing. 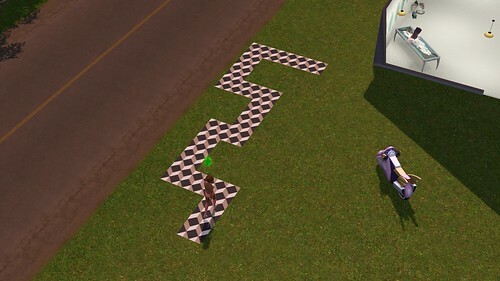 Routing has been the difference between a playable and non-playable game in The Sims 3. Ever have even a few Sims try to exit the door of your house at the same time? Tapping feet and action cancellation galore! Well no need to worry anymore. 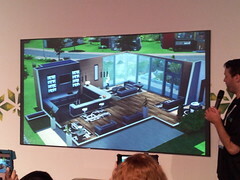 She also showed us the same animation with the same Sims exiting the demo house through one narrow door. Dangerous situation right?! Nope! Not a single Sim was stuck, and the game did not cancel their actions. I couldn’t believe my eyes! This will never happen in game again! Another demonstration was a group of Sims conversing in a circle, and one Sim at the end of the house having to pass them and any objects in the home in order to go outside. Low and behold, she went around the Sims and objects just as you and I would. No issues! 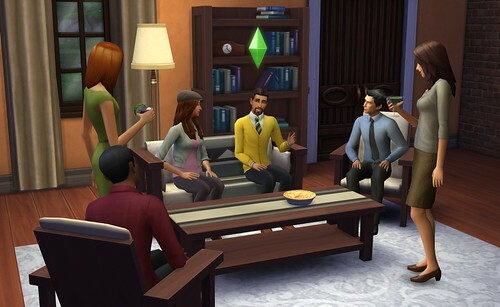 To ensure that the animations during group conversations mimicked those of a human being, The Sims 4 Team hid a camera in a party room at the EA Headquarters to monitor the natural behavior of social interactions. Marion also experimented during the time she was recording, so she forced certain actions from social groups. After watching the video, they duplicated the same animations and actions in game. When one person leaves a social group, the rest of the Sims will naturally “close the gap” to form a circle again. When people are conversing in groups, they will look at one another no matter if they’re standing or sitting. Basically, social group experience is getting a great update. 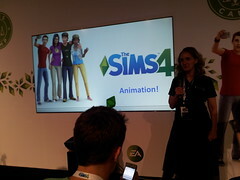 All the Animations for The Sims 4 are brand new. Nothing is recycled from previous games, and there is very minimal re-use of these new animations in game. They are literally building the animations system from the ground up just for this series. Another major improvement with animations is the blending system. In the Sims 3, Sims end any single animation and then “re-start” again for the next, no matter how many social actions are in queue. 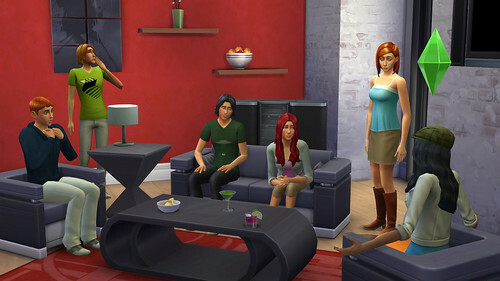 In the Sims 4, a Sim’s social interactions will flow naturally from one to the next. The one thing that did bug me was that the glass disappears into thin air when they are not drinking, and magically appears again from their butts when they drink. I’m not quite sure if this is anything that will change, but it is only part of animations that I did not like. ♦ Hair does not “bounce around” – There was nothing more said about this, however bouncing around and being dynamic (like The Sims 2) are two different things in my eyes. The animations system is the core of the game as far as I’m concerned, and I am very happy with everything I’ve seen thus far. If there’s one thing that I’m certain of, The Sims team is definitely working hard to produce a great game. With the final day of Sims Camp coming to an end, we enjoyed some last minute game time and socialized. 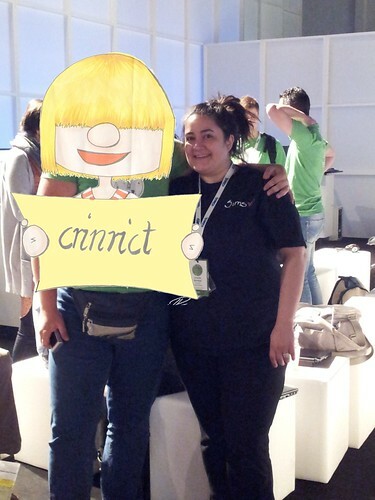 While we awaited our bus, I posed for a photo with the lovely Crinrict! I swear this photo is not photoshopped! After all the festivities of the week, we all enjoyed a final dinner together (Gurus and all), and headed back to the hotel to prepare for departure. *insert sad face* I had the most fantastical week ever, and met some amazing people. To EA, Maxis and The Sims Teams: Thank you for hosting this amazing event, and thank you very much for having me. Until next time!